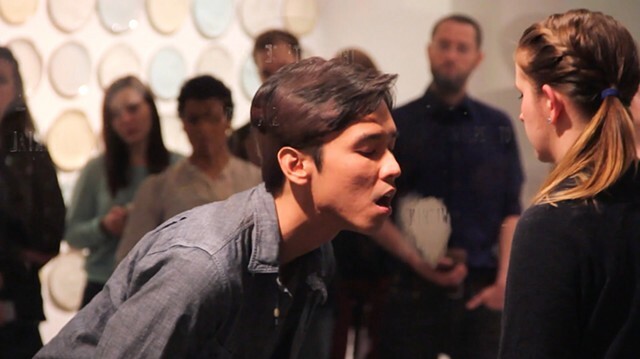 Between Two is a site specific performance. A row of concrete columns divides the room separating one side from the other. A transparent acrylic panel framed by two of the center columns emphasizes the division. On the surface of the panel semi-visual text is drawn. My hand is the writing instrument. Natural oils excrete from the fingertips leaving an invisible residue for each letter. Approaching the panel, an intimate encounter occurs when two people are facing each other. With the exhalation of the breath a fog appears. The condensation fills the space between the letters. Through improvisational movement the performers reveal a word to themselves, or a word to each other. As each one responds to the other, they reveal a word or phrase together. The words disappear as the breath dissipates, mirroring the transitory state of the encounter.